The recent noise coming out of the bed-in-a-box phenomenon is from a quiet sounding company named Whisperbed, the Brooklyn, New York based mattress company. Industry analysts say Whisperbed has designed a mattress specifically made for side-sleepers, the first of its kind in this category. It features a tri-zoned, latex foam top surface that yields to the side-sleeper’s shoulders and hips, while keeping the lumbar and lower back areas in a proper and balanced sleeping alignment. All the materials of Whisperbed mattresses are manufactured and assembled in North Carolina. The foam is poured and cured in the same factory that is assembling the mattress. “This makes for uniform and consistent quality control,” said Alex Varone, marketing director of Whisperbed. Even the mattress’s cover is woven and stitched in North Carolina. It’s currently available for under $800 in queen size, he added. And, in addition to being made an entirely in the U.S.A., Whisperbed is delivered directly to the customer’s door, usually within one week of purchase, according to Varone. 63% of people are side-sleepers, according to WebMD. Often those sleepers complain that mattresses cause pressure points to their shoulders and hips, cutting off blood circulation, and increasing their need to toss and turn throughout the night. Whisperbed claims to have the solution for those side-sleepers. 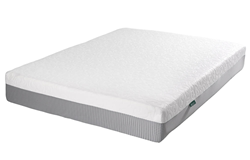 In addition to the tri-zone, latex foam top surface for side-sleeper comfort, their mattress also contains a two-inch layer of memory foam for support, and a six-inch layer of high-density foam for mattress durability. The company offers the most generous home trial period in the industry – 200-nights – a testament to its confidence in its comfort guarantee, said Varone.